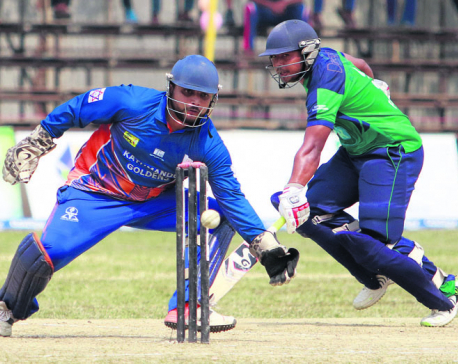 DHANGADHI, April 14: National skipper Paras Khadka-led Dhangadhi team Chauraha is on the verge of crashing out of Dhangadhi Premier League T20 Cricket Tournament, while Rupandehi Challengers, headed by veteran Shakti Gauchan, entered play-off as the latter recorded three wins from as many matches. The former is yet to taste a victory despite playing equal number of matches. In the matches played at SSP Cricket Ground, Dhangadhi, Chauraha faced its third straight defeat at the hands of CYC Attariya by 40 runs, while Rupandehi Challengers continued its winning streak beating Basant Regmi-led Kathmandu Goldens by 15 runs. Attariya won the toss and chose to bat first before making a total of 142 runs. Openers Dilip Nath and Roshan Nepali gave solid start to the innings as they built up a 30-run partnership for the first wicket. 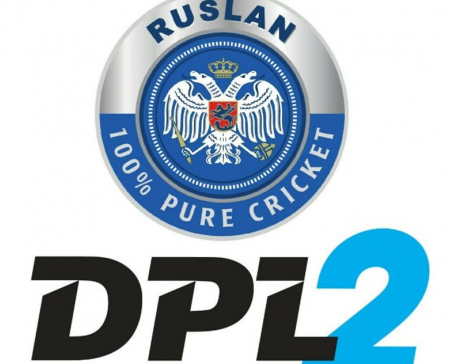 Dilip made 13 runs off 15 balls, while Roshan hit the highest 32 runs smashing three boundaries off 44 balls. Roshan also contributed to a 46-run partnership with Pradeep Airee for the second wicket. Karan KC and Yogendra Singh Karki contributed 25 and 27 runs, respectively, to put up a respectable total. Chauraha's Saurav Khanal claimed two wickets, while Aarif Sheikh and Sushan Bhari took one each. In reply, Chauraha was packed for 102 runs after it lost its batsmen cheaply. Although opener Anil Mandal gave positive start to the innings, making 19 runs, skipper Paras Khadka, Aadil Khan and Aarif Sheikh, were ducked. The three were sent to the pavilion in man-of-the-match Mahabob Alam's deliveries. Saurav Khanal and Ramnaresh Giri tried to consolidate the innings building up a 53-run partnership for the ninth wicket, but that wasn't enough. Saurav contributed 23 runs facing 31 balls, while Ramnaresh stroked 39 runs hitting two boundaries and four sixes off 20 balls. Besides veteran Mahaboob, Surendra Chand was the pick of the bowling as he took three wickets giving away just 15 runs. Binod Lama claimed two wickets for the team. Meanwhile, in the first match of the day, Rupandehi Challengers won the toss and decided to bat first to make a total of 135 runs. Rupandehi Challengers couldn't make a positive start to the innings as its opener Harishankar Shah was ducked by Kathmandu Goldens' Sompal Kami. But Shankar Rana and Nurdhoj Sen, building up a 46-run partnership for the second wicket, helped the team to put up a respectable total. Nurdhoj stroked the highest 37 runs for the team, smashing three boundaries and sixes, facing 22 balls. Player-of-the-match Puspa Thapa, who came to bat at fourth number, contributed 36 runs from 33 balls. Kathmandu Goldens' Sompal Kami took four wickets, while Manjeet Shrestha, Basant Regmi and Santosh Bhatta claimed one wicket each. In reply, Kathmandu Goldens made 120 runs in 20 overs, losing nine wickets. Kathmandu Goldens made disastrous start after its opener Naresh Budayair was ducked. Shubhendu Pandey and Sumit Maharjan tried to consolidate the innings, making 20 and 27 runs respectively, but the team lost the remaining middle order batsmen, including skipper Basant Regmi, Bhuvan Karki and Sompal Kami, cheaply. Skipper Regmi made just four runs while Bhuvan was ducked. Sompal contributed six runs. Rupandehi Challengers' skipper Shakti Gauchan claimed three wickets, while Bikram Sob and Krishna Karki took two wickets each. On Saturday, Biratnagar Kings and Kanchanpur Iconic will battle in the first match of the day, while in the second clash, Chauraha will take on Kathmandu Goldens.